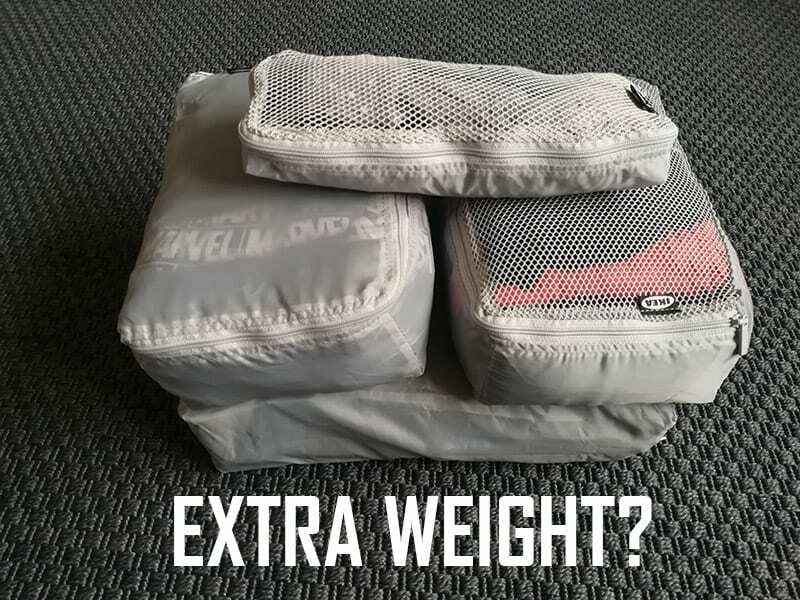 How Much Do Packing Cubes Weigh? Apparently, Not That Much! Packing cubes have been around for a while. They’re great for packing more efficiently and staying organized on your vacations. However, some remain sceptical whether they’re worth it. Is it worth adding that extra weight to your already over-packed suitcase? And how much do packing cubes weigh on average? I researched everything about packing cubes, to find out if they’re worth using. Well, it turns out that they’re not that heavy after all. At least, most of them aren’t. Is it worth paying more for lightweight packing cubes? Are packing cubes worth it? On average, a set of packing cubes weighs anywhere from 4 ounces (113 grams) to 14 ounces (400 grams). Of course, this depends heavily on how many pieces are included and what materials is it made from. Eagle Creek Pack-It compression bag set 2-piece set – 7.7 ounces / 218 grams. If you compare this to the average weight of luggage (which is about 12 pounds), the extra weight is minimal. If you’re paying more solely for the reason that they’re lightweight, probably not. A set of regular packing cubes usually weighs similar to the weight of a hoodie, and lightweight cubes identical to the weight of a regular t-shirt. Would you pay 25$ extra for saving extra 3 – 7 ounces, which would be comparable to leaving a single t-shirt home? The cubes retain a square form when fully packed, so it’s easier to stack them next to each other. In summary, I’d advise you to look at the bigger picture. Yeah, it’s cool that you get to save extra 7 ounces, but are there any other added benefits? Packing cubes are shaped in a rectangular shape and are perfect for stacking everything neatly into your suitcase. On the other hand, compression bags are better used for items that can get wrinkled and when you’re really short on space, like on a camping trip. The main idea is that you fold everything into your compression bag, and with the help of an additional zipper, squeeze everything tightly together, reducing the total volume of the bag by half. While packing cubes are better for staying organized in your luggage, compression bags let you fit your clothes into tighter spaces, like a backpack. From my own experience, I prefer to use packing cubes almost every time over compression bags. If you roll your items and place everything tightly together in the packing cubes, you basically get around the same space-saving results as using compression bags. A bonus is that I can easily organize my clothes in every packing cube. For instance, I usually pack my underwear & socks in one cube, tees & hoodies in another and so on. I’ve only used compression cubes for my hiking trips when I had to stash the sleeping bag, tent, camping gear, e.t.c. in one giant backpack. I was amazed that actually a lot of people are using regular Ziploc bags to pack their clothes in luggage. By reading further, I can understand why… You can compress the bag with less air in it, they’re waterproof, and you don’t get the smelly odour of dirty clothes after the first week of travelling. To be frank, I’ve never used Ziploc bags for packing, and I feel that I never will. Here’s why. By using Ziploc bags, your clothes get way more wrinkles than from packing cubes. Overall, it’s just way messier to pack and unpack. With packing cubes, you got everything organized and neat. Ziploc bags are less durable than packing cubes. I’d imagine they have to be swapped pretty often. If you’re a frequent traveller like me, that’s a big no-no. Although Ziploc bags are waterproof, I have yet to experience getting my clothes wet from being stacked in packing cubes. Even if you get caught up in the rain, it’s usually a light one, and only the luggage shell gets a bit damp. Generally, I feel that packing cubes are a step-up from using regular Ziploc bags. You can get a four-piece set of packing cubes for just about twenty dollars, which is not that expensive. Also, if you’re looking to shed some weight, as discussed earlier, packing cubes aren’t that heavy anyway. So by utilising plastic bags, you’d only save a few ounces. Yes, yes, yes! I cannot stress enough how packing cubes have changed the way I pack. A few years ago I was just like everyone and regularly packed without any proper techniques. When I started travelling more often, I learned a few tips for more efficient packing. Nowadays, I rarely use any checked luggage. If I’m travelling for one to three weeks, I can easily fit everything in my carry-on. Can you imagine how much have I saved on check-in fees over the years? More organized packing. Stack your underwear and socks in one cube, tees, shirts and hoodies in the second, pants and jackets in the third, and lastly, your shoes and other items in the last packing cube. Now it’s way easier to find what’s where. Quicker packing and unpacking. After your second or third time using packing cubes, you get used to storing specific items in specific cubes, which makes preparation for your trips much quicker. Saving some space. I must say that the space savings are not huge. Nevertheless, you still save some space when using packing cubes. They cost just a few dollars. I mean, it’s not like you’re investing into something expensive. You can get a set of packing cubes starting at 20$, with the most expensive options at 50$. If you’re really tight on budget, IKEA packing cubes can be bought for under ten bucks in your nearest IKEA store. However, I must say that when they’re packed full, they lose their rectangle shape, which has opted me to use more expensive alternatives. If you want to know what are the best options out there, here’s a list of the 10 best packing cubes for carry-on luggage.